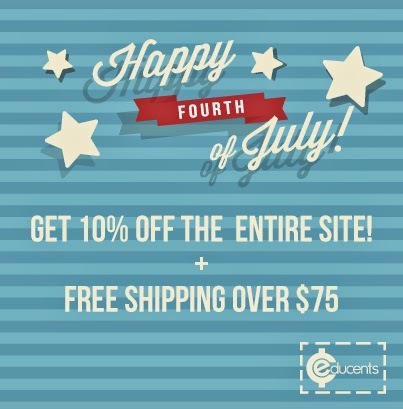 Pinkadots Elementary : Post Card Exchange Info and Tips & Educents Coupon Code! 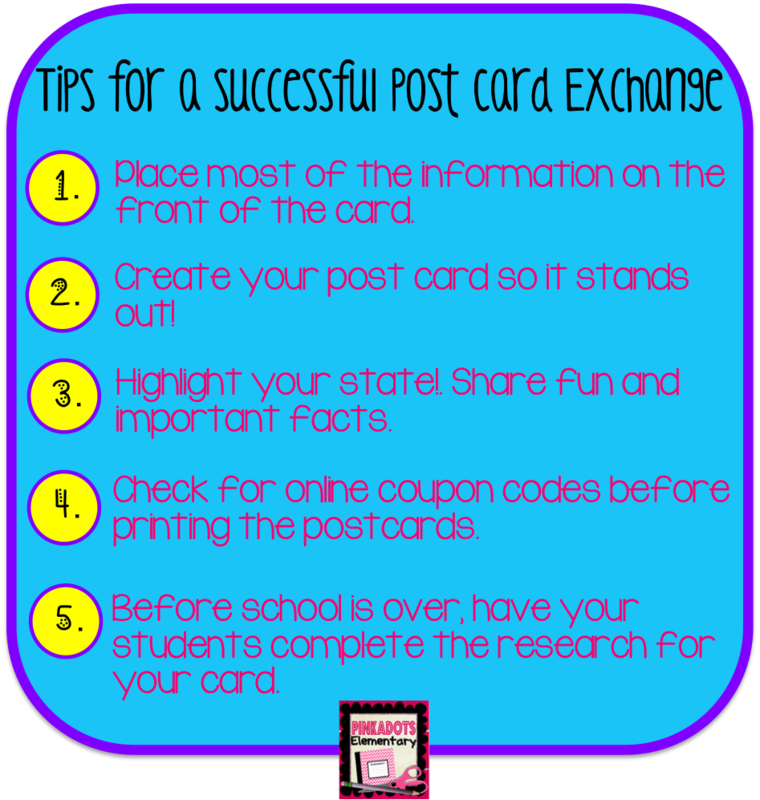 Post Card Exchange Info and Tips & Educents Coupon Code! 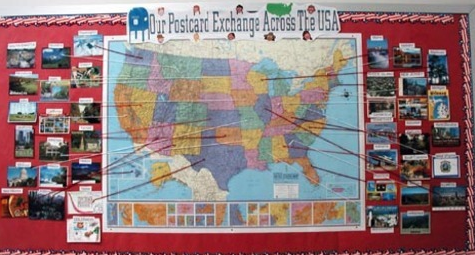 I am so excited to order my post cards for the new postcard exchange. Have you ever heard of one of these? Basically a responsible teacher creates a sign up list for one teacher from every state. You can find sign up links on Facebook posts, Instagram, or even on a blog. (My friend Emily is really good about finding them and posting the new ones on her Facebook page, here!) There are a few exchanges still looking for participants...1, 2, 3. All you need to sign up is your school mailing address and a promise to create and send out 49 postcards (one to everyone on the list except for you). I participated in an exchange a few years ago and created a great card on Vistaprint. I found this company to be the best because the price was right, I could upload both sides of the card, and I could customize everything. Some of the cards I received were generic cards from the states and were perfectly fun to receive and read. Some teachers hand wrote the information, had their students write the information, or printed and taped the information on the back of the postcard they wanted to share with the recipiants. If you would like to participate, but aren't sure what to do, don't you worry! I learned a few tips that I am going to share with you. #1. If creating a postcard, put most of the information on the front. When it is hung up, only one side is able to be seen (unless it hangs from the ceiling). I did try photo copying the opposite side of the card, if there was fun information on both sides, but it wasn't as "pretty". #2. Make your post card stand out. Use fun pictures, colors, and fonts. Make people want to notice your state. You can borrow images from a quick Google search or if you are hand making post cards, cut out pictures from travel brochures or magazines! #3. Highlight the exciting information in your state. Make your state sound fun and inviting. #4. If you are having postcards printed, check for coupon codes through a quick Google search before you place your order on Vista Print. There are many deals online to save you money, you just have to search! Sometimes you can even get them printed for free. #5. Before school is out (if you remember) have your class write a blurb about your state. They can research important facts and information. The class can combine the information and it can be used for the next postcard. Since these are sent very early in the school year, I like to get them printed in the summer, so they are set to go. Here is my new postcard. My 2013-2014 class came up with the blurb (that is on the back explaining each picture). 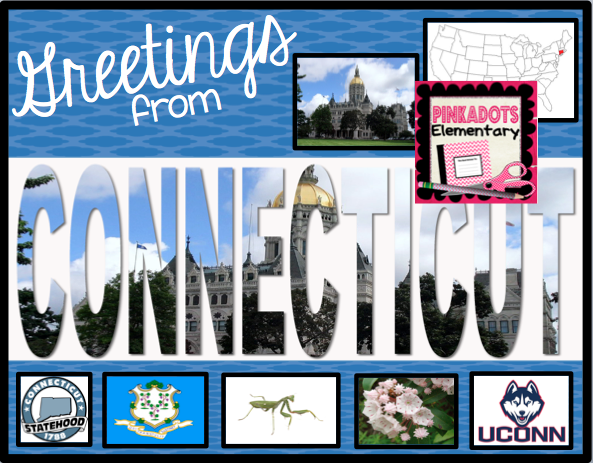 The front letters spelling out Connecticut took me about an hour to create. I followed an online tutorial. They aren't perfect, but they are unique. I am so excited to tell my new class about this project in the fall. I'm sure they are going to LOVE getting mail and seeing the information shared with us on each card. We also study the regions of the United States in Social Studies. This will fit into the curriculum perfectly! Click on the link below and check out the specials available! This is so neat! We also are supposed to teach regions but sometimes get squeezed for time and it doesn't always happen. This will be a great way to make sure we keep u with it during the school year! I signed up for the third one! :) I'm super excited and excited to see how it goes. You're so lucky to have gotten all the cards! I've done a couple of these over the years and have been burned every time! I usually end up with about half of the promised cards coming in. I did one last year and only got 14 cards...I'm taking a break from it this year, but I love the idea of using Vistaprint to make the cards instead of buying 50 from the drug store and then taping the info to the back!